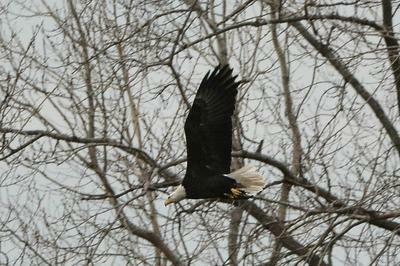 A pair of Bald Eagles sighted on East Wyandotte in Windsor. Open stretch of farm fields divided by row of tall trees. Seemed to be the only undeveloped land on Wyandotte East. Thank you Lisa, for sending us this report of your sighting of a Bald Eagle - I'm sure the residents of Windsor will keep their eyes open for this magnificent bird!